Copper deficiency is a disease that causes cytopaenia and neuropathy and can be treated by copper supplementation. Long-term tube feeding, long-term total parenteral nutrition, intestinal resection and ingestion of zinc are known copper deficiency risk factors; however, alcohol abuse is not. In this case, a 71-year-old man had difficulty waking. He had a history of drinking more than five glasses of spirits daily. He was well until 3 months ago. A month before his visit to our hospital, he could not eat meals but continued drinking. He had macrocytic anaemia on admission. Copper and ceruloplasmin levels were markedly low, and we diagnosed copper deficiency. There were no other known risk factors for copper deficiency. After he began drinking cocoa as a copper supplement, the anaemia ameliorated and he was able to walk. This is the first report showing alcohol abuse as a risk factor for copper deficiency. Copper deficiency is a disease that causes blood cell abnormalities such as anaemia and leucopaenia1, and neurological symptoms such as neuropathy, myelopathy and vision loss.2 It needs to be differentiated from vitamin B 12 deficiency. Although the precise frequency is unknown, primary copper deficiency is relatively rare because copper is universally included in the diet.3 Therefore, it should be suspected when the patient has a known risk factor. Current known risk factors include special nutritional conditions such as long-term tube feeding4 and long-term total parenteral nutrition5, gastrointestinal problems such as postgastrectomy6 and postobesity surgery7 and other conditions, such as ingestion of zinc.8 There are also several copper deficiency case reports of unknown causes,9, which suggests that there are other risk factors. Currently in the literature, there are no case reports of alcohol abuse as a risk for copper deficiency. We experienced a case of copper deficiency due to alcohol abuse without other known risk factors. A 71-year-old man was a long-term alcoholic that drank more than five glasses of spirits daily. Beginning 3 months ago, he began to eat less at meals that consisted mostly of raw fish and meat and continued to drink alcohol. However, he had no other problems in daily life. One month ago, he could no longer eat meals but continued drinking. At about this time, he became unable to walk and managed by crawling. A day before his visit to our hospital, his behaviour became unintelligible, and he was brought to our hospital by ambulance. He had a history of hypertension and dyslipidaemia and took amlodipine and rosuvastatin. He has no history of surgery and he did not take zinc medication or supplementation. Vital signs were the following: blood pressure 96/72 mm Hg, pulse 89/min, body temperature 36.7°C, respiration rate 15/min at time of visit. He lost consciousness and could not understand where he was or respond to instructions. His ocular conjunctiva was yellow tinged and he had a flapping tremor. He had an abdominal bulge and no knock pain around his liver. He had brown diarrhoea, not tarry stool. He was unable to stand up to both knees. Babinski reflection was positive. He was uncooperative with our physical examination, and as such, a detailed neurological examination including serial exams was not possible. Blood tests revealed a white blood cell count of 5190/μL without abnormal fractionation. His haemoglobin (Hb) was 7.8 g/dL (normal range 13.5–17.6 g/dL), mean corpuscular volume was 107.4 fl (normal range 83–93 fl), reflecting macrocytic anaemia. Platelet count was 11.7×104/μL (normal range 13.1×104-36.2×104/μL), reflecting mild thrombocytopaenia. Aspartate aminotransferase was 477 IU/L (normal range 7-97 IU/L), alanine aminotransferase was 155 IU/L (normal range 6–43 IU/L), blood urea nitrogen was 26.7 mg/dL (normal range 10–20 mg/dL), creatinine 2.41 mg/dL (normal range 0.6–1.0 mg/dL), that is, liver and kidney dysfunction were also observed. Blood glucose level was normal (137 mg/dL). Ammonia level increased up to 166 μg/dL (normal range 30–80 μg/dL). His serum ferritin also significantly increased up to 9506 ng/mL (normal range 39.4–340 ng/mL). C-reactive protein was 5.89 mg/dL (normal range 0.0–0.3 mg/dL). However, urinary white blood cells and bacterial urine were negative, thus excluding pyelonephritis. In addition, ascites had no bacteria, while white blood cell count in ascites was 32/μL, thus also excluding spontaneous bacterial peritonitis. The following data are reference values because these blood tests were investigated after vitamin ingestion at the emergency department; serum vitamin B1 91 ng/mL (normal range 24-66 ng/mL) and serum vitamin B12 >1500 pg/mL (normal range 180-914 pg/mL). Prothrombin time (PT) was 16.5 s (normal range 11–14 s), PT% was 51.9% (normal range 80–120%). Head CT revealed no abnormality, however, abdominal CT showed an advanced fatty liver and a massive amount of ascites. Since he ramped and was uncooperative with our investigation, it was impossible to conduct a detail examination such as with upper gastrointestinal endoscope to rule out gastrointestinal bleeding. MRI of the spine and brain to confirm the cause of being unable to walk was also not possible. Initially, we suspected vitamin B12 deficiency with hepatic encephalopathy and prerenal renal failure. Therefore, intravenous vitamin B12 supplementation (more than 1000 µg daily), branched chain amino acid (BCAA) administration and replacement fluid were administered. Lactulose was not used because he was not constipated but rather had diarrhoea. Lorazepam was also administered to prevent alcohol withdrawal. Antibiotics were not used because there was no finding to affirm bacterial infection. In addition, corticosteroid was not used because there were few findings to suggest acute alcoholic hepatitis such as fever, tachycardia and liver knock pain. These treatments, however, did not recover symptoms, which instead worsened. For that reason, we suspected another disease: copper deficiency mimicking vitamin B12 deficiency. Later on, tests showed that the serum copper level was under 2 μg/dL (normal range 68–128 μg/dL), and the serum ceruloplasmin level was 8 mg/dL (normal range 21-37 mg/dL). Therefore, we diagnosed that the main disease was not vitamin B12 deficiency but copper deficiency instead. Additionally, his delirium worsened with strong outbursts, thus treatment continuation was extremely difficult. His family asked that we stop aggressive medication treatment and try only two to three cups of cocoa, which can supplement copper daily. Serum copper and ceruloplasmin recovered rapidly, serum ferritin declined and blood cell count recovered after just a few days of drinking cocoa. His delirium also disappeared rapidly from the day after starting cocoa. Moreover, activity of daily life recovered rapidly (figure 1). Because he became cooperative with medical treatment, we used diuretics and BCAA sequentially. Eventually, he could walk on his own and was discharged on the 74th day and was ambulatory. Clinical course of this case. Initially, symptoms did not improve with multiple treatments. However, it improved dramatically with copper supplementation via cocoa. ADL, activity of daily life; BCAA, branched chain amino acid; Hb, haemoglobin; Ret, reticulocyte. The blood cells subsequently recovered: Hb 14.3 g/dL, however, Babinski reflexion remained positive 4 months after the start of copper supplementation. He continued abstinence after being discharged from our hospital and has had no relapse after 2 years of follow-up. This is the first case report clinically, suggesting that excessive alcohol consumption can be a risk factor for copper deficiency. Copper is an essential element in the body, absorbed from the jejunum to duodenum,10 and it spreads throughout the body via the liver. It acts as a coenzyme for many enzymes, and in particular, plays an important role in the bone marrow and nerve system.11 Therefore, copper deficiency can result in blood cell abnormalities such as various types of anaemia (microcytic, normocytic, macrocytic anemia) and leucopenia1, and neurologic symptoms such as neuropathy, myelopathy, and vision loss2. In particular, it is important to differentiate this from vitamin B12 deficiency because the phenotypes are similar. Copper supplementation recovers blood cell abnormalities favourably.3 For neurological symptoms, however, the recovery is partial, and it is thought that neurological symptoms will become irreversible if treatment is delayed.12. Therefore, it is important to diagnose copper deficiency and start treatment early. Copper deficiency may be overlooked. Although the exact frequency of copper deficiency is unknown, primary copper deficiency is considered relatively rare as copper is included in most diets.3Typically, clinician awareness is low,13 which makes correct diagnosis difficult. Generally, we suspect copper deficiency if the patient has a known risk factor. Known risk factors include special nutritional conditions such as long-term tube feeding4 and long-term parenteral nutrition5 or gastrointestinal problems such as postgastrectomy6 and postobesity surgery7 or other conditions, such as zinc intake.8 There are several case reports about copper deficiency of unknown cause.9 This suggests that clinically there may be other risk factors. This case clinically suggests that excessive alcohol consumption can be a risk factor for copper deficiency. There are three reasons supporting this. First, the patient did not have any other known risk factors, and he was not a candidate for any other remarkable cause other than excessive alcohol consumption. Moreover, he had no recurrence after abstinence and after the copper supplementation. It was possible that a decreased volume of meals might have affected the onset of copper deficiency, however, this alone could not explain the progression speed of the disease such that the condition emerged after only 3 months of not eating properly. It is most likely that prior to 3 months ago he had small meals. Moreover, he was eating fish and meat, which contain ample amounts of copper. Therefore, we think that it was less likely that he became copper deficient from diet alone. In previous reports, it takes more than a half year to 1 year for copper deficiency to emerge in long-term tube feeding or parenteral nutrition.4 5 Thus, an insufficient intake by itself would not explain the short 3-month course. Second, experimental data from rat studies14 by Fields et al reported that copper deficiency with organ disorder did not occur in rats fed a copper deficient diet. However, organ disorders such as anaemia occurred in rats fed a copper deficient diet and 20% ethanol for 6 weeks. Although this was experimental rat data, it suggests that alcohol consumption causes copper deficiency. Third, there is human epidemiological data.15 Zhang et al reported that serum copper levels in healthy Chinese volunteers who drank regularly were significantly lower than that who did not have a drinking habit. Although it is unknown whether the organ disorder of copper deficiency occurred in this report, it suggests that drinking alcohol affects human copper metabolism. Based on these supporting studies, this case clinically suggests that alcohol abuse can be a cause of copper deficiency. Unfortunately, the exact mechanism whereby alcohol causes copper deficiency is unknown. From the point of view of rapid disease progression, new mechanisms may be considered, such as copper consumption or excretion promotion rather than a problem with intestinal absorption. An effective method of copper supplementation is oral administration of cocoa. Although the amount of necessary copper supplementation is not established, it is said to be 2 to 6 mg/day,12 16 which is several times the required amount of copper, which as an essential dietary micronutrient is 0.9 mg/day17. However, when copper is deficient, absorption efficiency from the intestinal tract increases18 if there are no problems with the intestinal tract, and thus an extreme increase may not be necessary. In this case, we chose cocoa as a copper supplement. Cocoa contains a moderate amount of copper and is a convenient beverage.19 20 This cocoa contained about 0.2 mg of copper per cup, and as such, he consumed 0.4 to 0.6 mg/day. His symptoms dramatically improved even with this small amount of supplementation. This case report has some limitations. First, it is difficult to precisely distinguish neurological symptoms including delirium from hepatic encephalopathy and alcohol withdrawal. However, treatment of hepatic encephalopathy or alcohol withdrawal did not improve his symptoms, which instead worsened. Meanwhile, his neurological symptoms such as delirium recovered from the very next day after copper supplementation. From this characteristic course, we presumed that the main pathological condition was copper deficiency. Second, we did not prove that there was a blood cell abnormality due to copper deficiency by bone marrow examination. Therefore, it is difficult to distinguish from blood cell abnormalities due to alcohol toxicity. However, the dramatic progressive increase in reticulocytes in just a few days after copper supplementation by cocoa suggests that copper deficiency was the main cause. We experienced a case of copper deficiency due to an excessive habitual alcohol consumption. We encourage clinicians to suspect copper deficiency when patients with an alcohol habit have blood cell abnormalities and neurological symptoms. Further investigation is needed to elucidate the mechanism causing copper deficiency with excessive alcohol consumption. 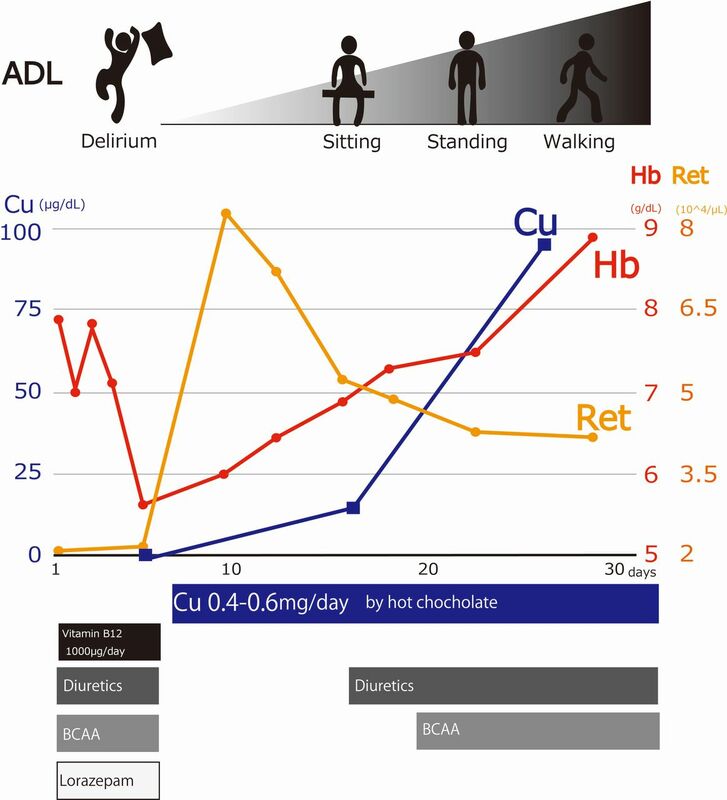 Copper deficiency should be part of the differential if patients have blood cell abnormalities and neurological symptoms. Alcohol abuse can be a risk factor for copper deficiency. Cocoa can easily replenish copper requirements.
. Copper absorption, excretion, and retention by young men consuming low dietary copper determined by using the stable isotope 65Cu. Am J Clin Nutr 1998;67:1219–25. Contributors Authors’ contributions are following: SS, corresponding author wrote the draft. SU, KT and NT revised the article for intellectual content.